One of the problems with most business books is that instead of dealing with a very real problem in very concrete terms and seeking out some very practicable answers, they tend to work along the edges, tackling small headaches that have fairly self-evident solutions which, because of their utter obviousness, don’t need to be backed up with real hard data – because we’ve all experienced what the authors are telling us anyway. There are probably a lot of reasons for this – stupidity, laziness, the desire to create a book (as opposed to solve a real problem) – but let’s be generous and say that the reason we don’t see real concrete solutions to real problems is because real problems are hard to uncover, that real solutions are even harder to come by, and that real data about real problems and real solutions is harder still to generate and takes way too long anyway. To answer this infinitely more difficult but correspondingly more useful question, Collins assembled a team that looked at over 1400 companies from the Fortune 500 between the years 1965 and 1995, in an effort (and I’m drastically simplifying here; you can read all the details in the book’s appendices) to find two comparable companies in each of several different industries. Two companies that, at roughly the same point in time were very similar in terms of size, financials and outlook. Two companies which nevertheless widely diverged in the future; one became very successful and the other one didn’t. And then they asked why. And when they came up with a couple of reasons why, they tried to organize this information into lessons that companies could follow, or at least be apprised of, in their efforts to be successful too. And over the course of the chapter, Collins and his team tell their histories and try to figure out where A&P went wrong – and more importantly, where Kroger went right. And while their journeys are interesting, what makes “Good to Great” so valuable is that they pull from this comparison a lesson, one of six that readers can use to guide their companies. And then they do it again and again throughout the book, with companies ranging from banking to steel to pharmaceuticals. But does it work? Will it make you, you know, great? Well, no and yes. On the one hand, the examples are a little dated (as one might expect from a book published over a decade ago). Thus some companies that looked smart in 2001 shine a little less brilliantly today (I’m looking at you, Fannie Mae and Circuit City). But the subsequent success or failure of those individual corporations ignores the forest for the trees. The lessons are what’s important here and they remain applicable even if some of the companies they were learned from have subsequently forgotten what got them to the promised land in the first place. It’s these lessons – many of which you may find counter-intuitive (I know I did) – which will force you to reexamine your own prejudices, habits, fixations and weaknesses. And you can never have enough of that, whatever business you or your clients are in. 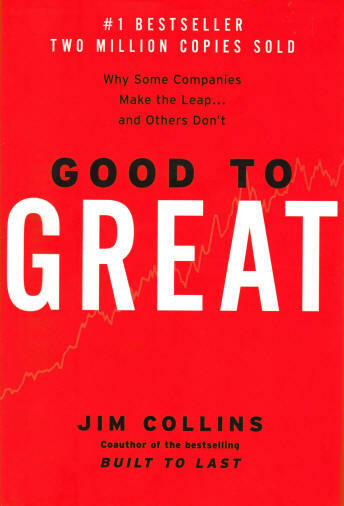 Good to Great by Jim Collins was published by Harper Business on 10/16/01 – order it from Amazon here or from Barnes & Noble here – or pick it up at your local bookseller ( find one here).